So, in the last four days I wrote my thesis paper. Yes, you read that right. It has hell, it was four days of absolute stress, four days of reading so many papers that all words just lost all their meaning. Frustration, depression, anger. It also was four days when I fell in love with Pride and Prejudice all over again. Reading Austen, or well, reading about reading Austen, has shown me that there is so much more to the novel than meets the eye when you read it for the first time. However, some opinions are just wacko. I wish I could have used that sentence in my paper haha. It was an interesting experience but I must say, I hate the academic style of writing (both reading academic papers and trying to write them). I felt as pretentious as Lady Catherine. One of the funniest parts was when I had too much written M used a Project Runway quote on me (“Use your editing eye.”) He was also a sweetheart, helping me figure out how to make footnotes go from number one in each chapter. Anyways, I spent the whole weekend ball and chained to my computer and didn’t leave the flat save for walking the pig, but I did go out to dinner on Friday night and here’s what I wore. I found the name of these shoes to be very appropriate for my situation. This morning something rather unexpected happened, my Miscrosoft Office (with its Word) stopped working. It was some issue that is now resolved but it did take about an hour or longer to fix and if this had happened yesterday I would have been screwed. Anyways, back to Friday. 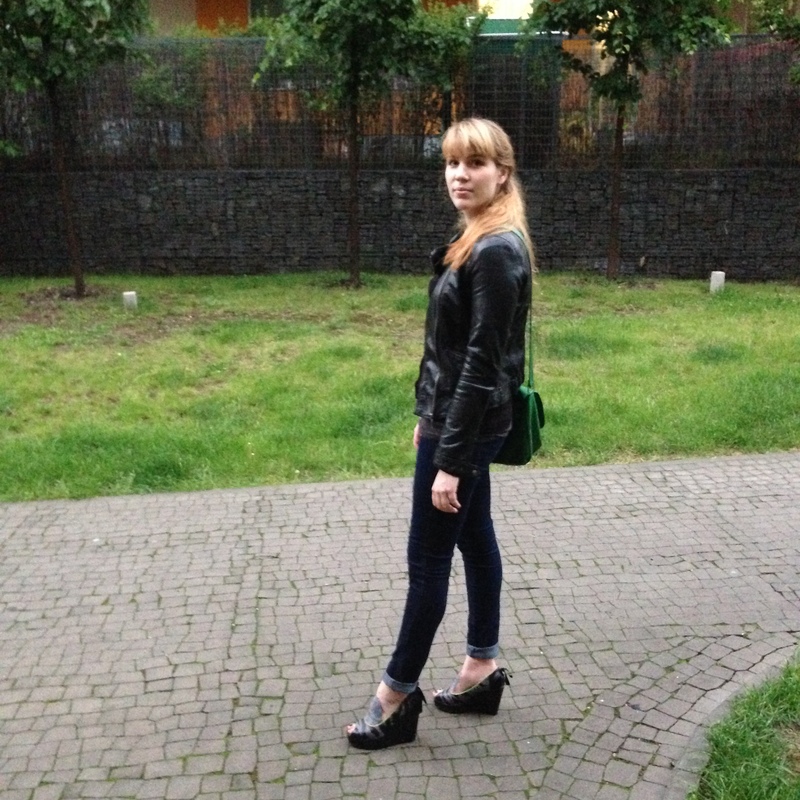 It was raining like crazy and I had originally planned on wearing suede wedges, yeah, suede. Not the best idea in Spring. I then changed my mind and decided to wear these shoes instead. 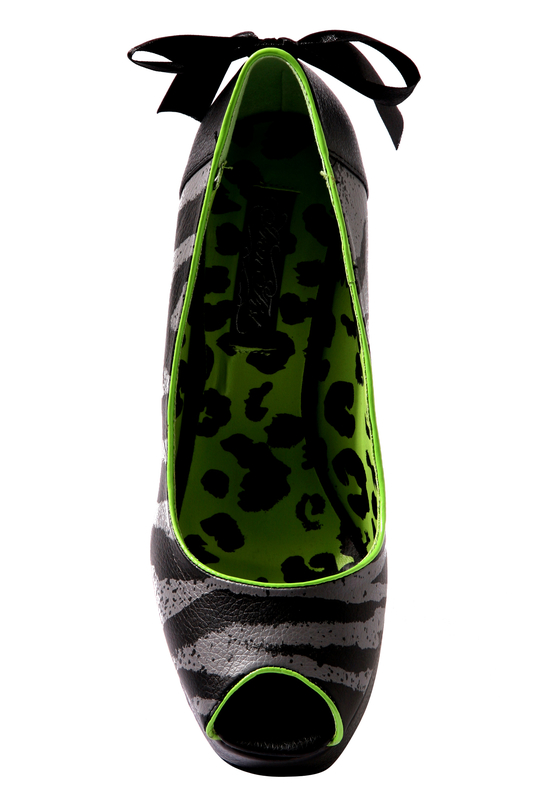 They’re by Iron Fist and have a lovely zebra print (I’m not much of a zebra print fan actually. I much prefer leopard print but on these I love the zebra – perhaps because it’s not black and white but black and grey. A subtle zebra is more me I guess.) I also really love the neon green lining of the shoe. So pretty and unexpected. I wore a new pair of jeans (they were sooo cheap!) from H&M, my favorite fake leather jacket (Zara), a black button down cardigan (Pull & Bear) and a grey tank top (H&M). The green satchel bag is also from H&M and is really old. I wanted to accent the green lining of the shoes and I think it worked quite well. I’ve been living in jeans lately, it’s just so easy. I always fall back in love with jeans in the Spring, I think it’s mainly because I hate wearing jeans with boots (stuffing jeans into boots is just so awful) and you know how some people hate wearing tights? Well I love tights but hate socks. Or not hate, but I just don’t like them very much. So when it’s finally warm enough to go out in bare feet, I love wearing jeans. I really liked how the outfit looked and I felt great in it , though I must say I think these shoes run a little big and I was glad I wasn’t wearing tights as I would have otherwise probably fallen out of them. I think these shoes are really comfortable and though it was the first time I have worn them, I know it won’t be the last. I’m too tired to write anything else (I went to sleep at about 4 a.m. and was already up at 8:30, I’m completely dead.) See you later. Thank you 🙂 I love the shoes, though I do wish they were half a size smaller. Well done! That’s it done, one less thing to worry about. I agree zebra print can look quite ‘harsh’ at times, but it’s nice in this subtle version.